The sound of falling water is always soothing to the mind. Studies have proven the positive effects of waterfalls to one’s health and well being. The freshness of air and their cleansing effect on the lungs leads to improved functions of the respiratory and pulmonary systems. It is for these reasons that wall fountains are increasingly becoming popular inside homes as well as out in the gardens. Designers have come up with wall fountains that are easy to install inside homes and offices. It is often the focal point of the room around which the rest of the décor revolves. Designers are able to artfully create these wall fountains inside homes without compromising indoor spaces. The addition of soothing sounds of falling water just adds to the serenity and peacefulness of the room. These are available in vertical designs as well as horizontal designs. They are made of slate, marble, stainless steel, granites, and mirrors. Fiberglass or waterproof resin is used to create fountains that resemble the copper and stone fountains of past centuries. 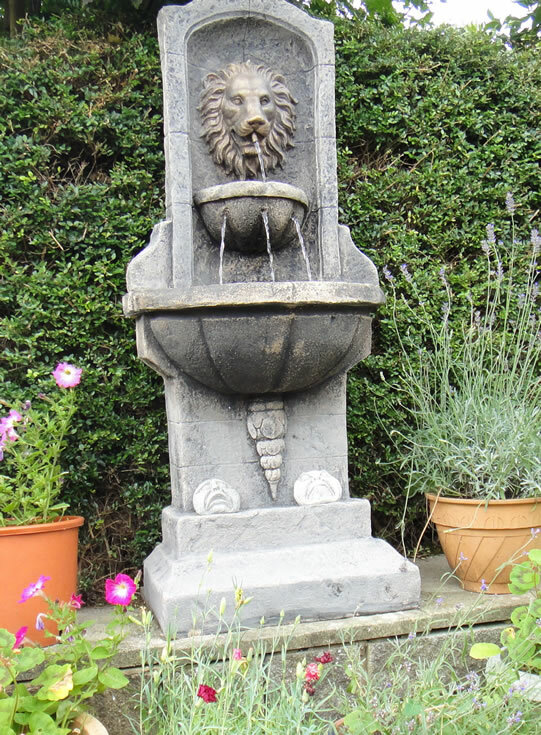 Outdoor wall fountains are available in a variety of designs including those inspired by Asian culture, Spanish villas, or the British countryside. The advantage of having wall fountains is that it adds to the tranquil atmosphere of your garden. It is possible to relax in front of the fountain listening to the sound of water falling after a hard day at work. Outdoor wall fountains do not take up as much space as a regular water fountain and hence can be installed in even small gardens. Since they are lightweight, they can be reinstalled easily if the garden is being rearranged. The presence of the wall fountain adds to the beauty of an exterior wall or even the fence in your garden. It can be mounted or free standing depending upon the space available.